The Sheena Douglass A Little Bit Sketchy collection is perfect for a wide range of crafty applications, including fun mixed media projects. This tutorial will take you step by step through creating a mixed media frameable art piece. Using the Torn centerpiece stamp, flower stamp and leaf stamp from the Clematis stamp set, along with the moths from Torn Moths stamp set, create a collage by stamping on Spectrum Noir Ultra Smooth Premium White Cardstock using Memories black ink. Color all elements with Spectrum Noir markers. For this step, have a second stamping of the centerpiece image stamped on scrap card stock, fussy cut out slightly smaller than the design. Wait about 30 seconds before placing fussy cut image over coloring to allow removable adhesive to set. I have also found it best to press my hand over the adhesive a couple times to remove some of the extra tackiness. This will help leave less residue on the colored image, aiding in less cleanup of the residue afterwards. Place the crackle pattern stamp from the Sheena Douglass Ageing Beautifully stamp set on an acrylic block. Using Memories black ink, stamp repeatedly to fill the entire background. Since the colored elements are masked, you can stamp right over the top of them and it won’t hurt the design. The masking will be removed in a later step and the coloring will be nice and clean. This pattern stamp is created to be random, and there is no special way that it needs to be lined up to make this work. Just rotate the stamp here and there and try to line up close to, or overlap slightly, the previously stamped images. Due to the nature of the Spectrum Noir Ultra Smooth paper, which is made for alcohol inks and not water based inks and sprays, use a heat gun to dry the paper during this step as noted below. Using one of the spray and sparkle cans, randomly spritz the color over the background in a few different spots. Heat briefly with a heat gun to speed the drying process. Repeat the process with each remaining color, using a heat gun to dry between each color application. Do not worry about spritzing over the colored elements, as the masking applied will keep them protected throughout this process. Airbrush over the pearly misted background using Spectrum Noir markers. Apply each color randomly in multiple areas, overlapping previous colors slightly to give a blended look. Using an adhesive eraser, rub over the rubber cement to remove the masking on all of the elements. Also use the eraser to remove any remaining temporary adhesive residue on the centerpiece image. Add dimensional paint over the colored elements. For this piece, a gold paint was used over the yellow flowers, a dark red/copper for the center of the flowers, a green paint was used over the leaves, and a clear paint was used over the remaining elements. This angled photo shows the dimension that the paints will bring to the piece. In this photo, the paints are already dry, so you can see how shiny and dimensional it will be. 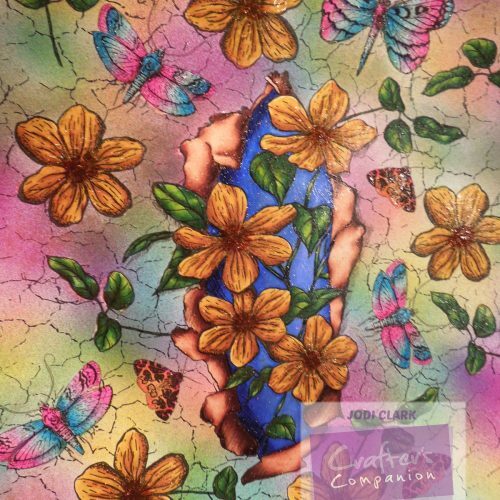 The final art piece is suitable for framing, using in a journal, as a background for a card or scrapbook page, or just about anything else you desire. We hope you loved Mixed Media as much as we do. If you attempt this tutorial please share your creations with us!